Last week as I sat on the porch swing on Saturday morning taking a moment to drink my coffee during my morning devotional I was caught off guard by her. I usually sit in the swing to watch the birds, but today I knew I didn't have unlimited time so I just sat with the intent of reading my scripture, writing briefly in my journal and getting back to work cleaning house. That is the rhythm of the school year with just two days to catch up on all that slips by during the harried Monday-Friday of school. I noticed that though there was no breeze, there leaves on one of the plants was strangely stirred. Trying to reason where the breeze was coming from I suddenly realized that I was sitting at an angle which made it impossible to see the hummingbird feeder. It was hummingbird wings!! The little bird made enough wind to disturb the plant far below. Its presence went unnoticed by the bees collecting nectar nearby. In the dim early morning light another bird approached the feeder, an imposter who could not sing, yet there he was drinking the nectar. It was a sight I had never before seen. A flock of Titmice hopped near to observe me sitting fixed in the swing. He had hopped the length of the hose and observed me from not more than two feet away when the movement of my pen gave me away. He is telling me something which would be so clear if only I spoke the language of the birds. As I sat there the gold finches returned to the feeder. 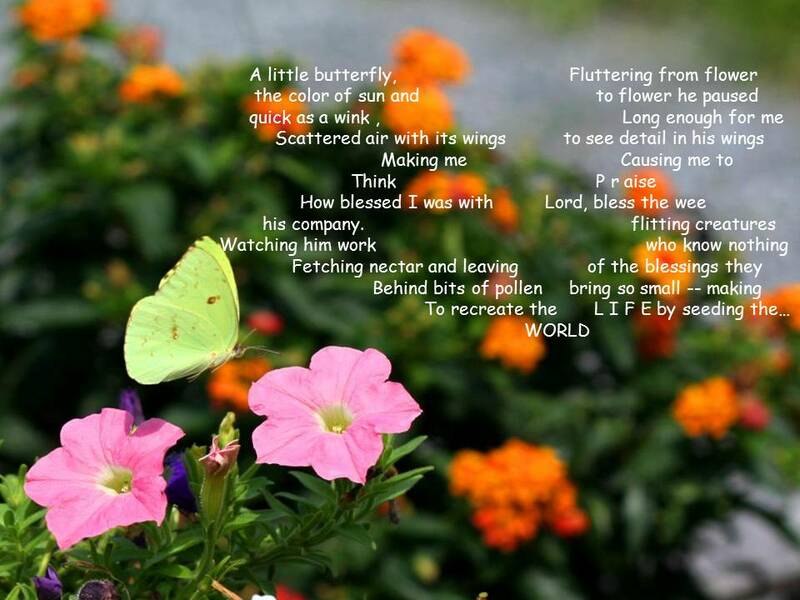 They had been absent for a long time....then a little yellow sulfur butterfly....entered the scene prompting the poem above.